Much ink has been spilled on the opportunities of pairing solar projects with energy storage. The PV+storage projects have been proliferating across the globe and a technology that was considered emerging in the not-so-distant past, seems to no longer be one. Distributed PV: aimed for energy prosumers and residential PV- i.e. self-consumption, grid parity, etc. The existing market is subsidy driven and available for Li-ion batteries (LiB) and Net Zero Energy House (ZEH), the primary objective of the latter is so that most new houses will have an annual zero net consumption and carbon emission by 2020. A number of additional options are poised to emerge after 2019 including selling surplus power at a lower value than feed-in tariffs; a committee by METI has estimated a price of 11 Yen per kWh. Centralised PV: aimed for energy producers and concerned with matters such as grid injection, PPA, etc. There are some subsidies and support available for these projects, which are provided by the local/ municipal government and not METI. The overviews presented below showcase the 15 centralised PV+storage projects, operational or under construction (some soon to be operational) as per beginning of 2018. The current cumulative capacity of the top 6 operational PV+storage plants in Japan is 44.3 MW. Whereas the estimated cumulative capacity of the PV+storage pipeline is 120 MW. 1	 UC	 >105	 SB Energy & Mitsubishi UFJ Lease & Finance Company	 F.O. F.O. >30	 F.O. F.O. F.O. F.O. 2	 UC	 >95	 Tokyu Land Corporation, Mitsubishi UFJ Lease & Finance Company & Green Power Development Corporation	 F.O. F.O. >30	 F.O. F.O. F.O. F.O. 3	 UC	 >65	 SB Energy & Mitsubishi UFJ Lease & Finance Company	 F.O. F.O. >20	 F.O. F.O. F.O. F.O. 4	 UC	 >40	 Green Power Development Corporation, Aquila Capital & other local institutional investors	 F.O. F.O. >10	 F.O. F.O. F.O. F.O. 5	 UC	 >35	 Smart Solar, RISA PARTNERS Inc	 F.O. F.O. >15	 F.O. F.O. F.O. F.O. 6	 UC	 >35	 Looop & Green Power Development Corporation	 F.O. F.O. >10	 F.O. F.O. F.O. F.O. 7	 O	 >30	 KEPCO& Energy Products F.O. F.O. >15	 F.O. F.O. F.O. F.O. 8	 O	 >25	 Orix & Solar Frontier	 F.O. F.O. >15	 F.O. F.O. F.O. F.O. 9	 UC	 >25	 Smart Solar	 F.O. F.O. >10	 F.O. F.O. F.O. F.O. 10	 UC	 >20	 Smart Solar & Japan Asia Investment	 F.O. F.O. >10	 F.O. F.O. F.O. F.O. 11	 O	 >15	 Obayashi Clean Energy	 F.O. F.O. >10	 F.O. F.O. F.O. F.O. 12	 O	 >15	 Hoosiers Holdings	 F.O. F.O. >5	 F.O. F.O. F.O. F.O. 13	 UC	 >5	 Japan Asia Investment	 F.O. F.O. >5	 F.O. F.O. F.O. F.O. 14	 O	 >5	 (unknown)	 F.O. F.O. >5	 F.O. F.O. F.O. F.O. 15	 O	 >5	 Hayashi Construction	 F.O. F.O. >10	 F.O. F.O. F.O. F.O. The data indicates that the Japanese PV+storage capacity is estimated to grow more than threefold by 2020. Approximately, 19% of the under-construction capacity is expected to be operational by the end of 2018. LG Chem Ltd. has dominated the storage battery market in Japan. The company has supplied storage systems to 2 of the 6 operational and 5 of the 9 under-construction solar plus storage plants, equating to around 47% of the 15 PV+storage projects in Japan. 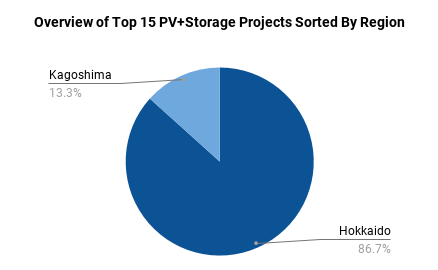 Hokkaido is the home to 87% of the largest solar plus storage projects in Japan. Hokkaido as well as the other neighbouring islands require storage batteries for PPAs, which seemingly has served as a catalyst to bolster the region’s PV+storage market. In addition, Hokkaido Electric Power Co Inc (HEPCO) has denoted storage battery a necessity based on the technical requirements, which involve measures against the (short-term)fluctuation in the energy generated by solar plants. Thus far, it is observed that battery storage has been deployed primarily in regions where it has been technically needed and in a way, born out of forced necessity. Overall, the trajectory of the Japanese solar plus storage looks only bright given the amount of PV+storage capacity to be operational over the coming few years. Furthermore, BNEF has forecasted a global decline of roughly $200 per kWh in Lithium-ion battery prices by 2030. In addition to the shrinking prices of storage technology, the Japanese utilities are forecasted to soon reach their maximum hosting capacity. This will result in curtailment and combining solar with storage can be an immensely valuable measure to mitigate risks, financial or otherwise, associated with curtailment.